YouTube member and craftsman HappyAtom has uploaded his latest video that goes over step-by-step instructions on how to recreate your own replica wooden shield from the Legend of Zelda. This is the latest video in a series, and the previous instructional videos covered making Link’s wooden sword and bomb (non-functional of course). He goes over the tools and materials you would need as well as provides the templates necessary for cutting the shape. Then he guides the viewer throughout the entire process from start to finish. I used a cupped (warped) pine board. It’s better than flat. This is a rather simple project, anyone can do it. You don’t have to do everything I do in the video; if you don’t have a router you can just skip that part. The artwork and template in the link below is for a 14″ shield. 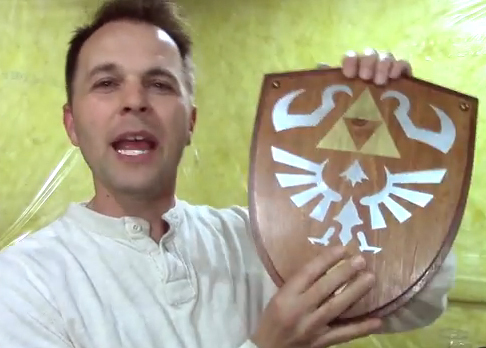 I will probably just make another video on how to make a larger shield. If you end up making one, let me know how it turned out. Anyone that knows me, knows that I have done a lot of projects like this one and crafted many items from the series for fun as well. So I love a video like this one where the maker goes over just how they managed to create the object. This was pretty informative for anyone who wants to recreate one of the most visual objects in almost any Zelda game.